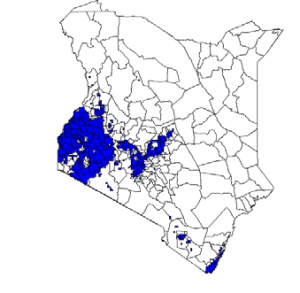 KARI ILRO has mapped several regions in Kenya affected by soil acidity. Three major soil classes in Kenya majorly affected by acidity include Nitisols, Acrisols and ferralsols. Regions such as Kisii, South Nyanza, Siaya, Busia, Bungoma, Kakamega, Kericho,Narok, Uasin Gishu, Marakwet, Baringo, Murang’a, Nyeri, Embu and Meru have Ph less than 5.5. These regions form the food basket of the country. On average, crops require Ph range of 7.0 – 6.0 for optimal growth. However, different crops have various degrees of tolerance to acidity. Chillies, sweet potatoes and irish potatoes are tolerant to acidity and can do well in soils with pH values below 5.5. Most of the horticultural crops (onions, spinach, carrots and cabbages) do not tolerate acidity and can only grow well in soils with pH values of 7.4 – 6.2. Other crops like maize lie in the medium tolerance range and would do well in 6.0-5.5 pH values. The blue coloration show acidic regions in Kenya. According to Timothy Munywoki, Amiran Cereal Expert, soils become acidic when basic elements such as calcium, magnesium, sodium and potassium held by soil colloids are replaced by hydrogen ions. Soils formed under conditions of high annual rainfall are more acidic than are soils formed under more arid conditions. 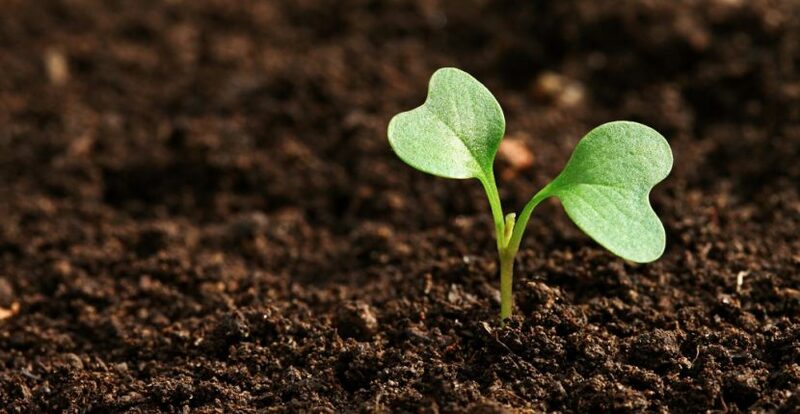 The major reasons for soils to become acidic include: Rainfall and leaching, use of ammonium-based fertilizers, acidic parent material and organic matter decay. The major cause of soil acidity in most agricultural soils is majorly attributed by use of Nitrogen fertilizers in ammonium form. Munywoki further clarifies that ammonium fertilizers react in the soil by the process of nitrification to form nitrate(NO-) and in the process H+ ions are released which are responsible for soil acidity. 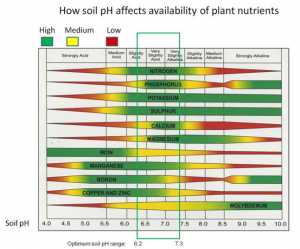 It is worth noting that the availability of some plant nutrients is greatly affected by soil pH. The ideal soil pH is close to neutral and falls within a range from a slightly acidic pH of 6.5 to slightly alkaline pH of 7.5. Acidity damages plant root hairs thus affecting the absorption of nutrients. To some extent, macro-elements such as Nitrogen, Potassium and Sulphur appear to be slightly affected by soil Ph; however, at acidic conditions, they are unavailable. Phosphorus is directly affected and at alkaline pH values, greater than pH 7.5 for example, the HPO-2 4 phosphate ions tend to react quickly with calcium (Ca) and magnesium (Mg) to form less soluble compounds. At acidic pH values, the H2PO-4 phosphate ions react with aluminum (Al) and iron (Fe) to again form less soluble compounds. Most of the other nutrients (micronutrients especially) tend to be less available when soil pH is above 7.5, and in fact are optimally available at a slightly acidic pH, e.g. 6.5 to 6.8. The exception is molybdenum (Mo), which appears to be less available under acidic pH and more available at moderately alkaline pH values. Farmers use different liming materials to increase the soil Ph. In modern times especially Wheat and Maize farmers in Narok and Uasin Gishu lease farms for say two seasons which makes them shy away from Using lime due to the fact that the normal liming material would take 3- 2 years to correct the soil Ph. Munywoki states that it is through these uncertainities that made Amiran to look for solution. Ecogrl from Amiran corrects soil Ph within 6 months (1 season) !!! EcoGRL is a granular reactive limestone with %99 less than 38 microns, which guarantees high reactivity in the soil (i.e. ECCE), high purity and ease of application. The liming material contains %39.6Ca, %87.3CaCO%1.13 ,3 Mg, %3.27Mgco%0.97 ,3Fe2O3, and %0.19 K2O. Eco Grl is an ideal product to correct soil acidity which negatively affects crop yields. Eco Grl stands out as the only liming material with finer particles less than 38 microns!!! This increases the surface area and makes it water soluble. This property enables Eco Grl to have high reactivity in the soil thus corrects acidity within a short period of time. The rates of application of Ecogrl are %10 of the normal lime and stands at 300- 100kgs/Ha.